10 piece Afro/Latin Funk dons 7Suns are back at Paper Dress on Saturday 13 April playing alongside bossa nova indie band Sugarcane and Jazz Soul trio Mochudi with Earthly Measures DJs spinning world grooves till 3am! Advance tickets £5 via DICE or £5 OTD! Verging on the outskirts of neo-soul, jazz, blues and folk, Mochudi’s music draws you in with it’s unique spirit. And here’s what Earthly Measures have to say about what’s in store..
We are heading to a new home! 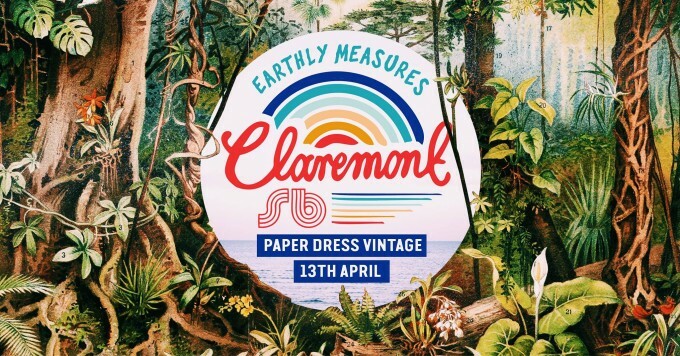 The surroundings of Paper Dress Vintage is where we will lay our hats for our upcoming events, with intimate sets lined up from some our favourite labels & DJ’s – whilst keeping in tune with the Earthly Measures vibe! Proceeds will once again got to Humanitarian & Environmental charity Tree Aid! For the first of our planned events at PDV, we welcome label head Paul Murphy aka Mudd of Claremont 56, a label that has been going strong for over 10 years, releasing beautiful Balearic vibes, that truly make you feel like you are floating on a cloud! In the past the label has been home to music from incredible artists such as the legendary Holger Czukay as well as Alumina, Idjut Boys & Paul’s own production team Smith & Mudd. 2018 saw another great year of releases for Claremont, with Pan Electric’s Sweet As Rain & Alterleo’s Sunset Sparks undoubtedly at the top of our end of year lists ! !